We are offering to our valued customers fine range of Sport T-Shirt. that is available in various sizes and a large number of hues. Banking on the skills of our qualified team of professionals, we are instrumental in offering supreme quality range of Ladies Sports T-shirt. 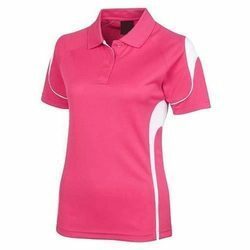 Our product range includes a wide range of womens t-shirt, womens plain t-shirt, womens scoop neck t- shirt, womens v neck t-shirt and manufacturer of ladies polo t-shirt, ladies collar polo t-shirt, ladies t- shirt, womens polo t-shirt, collar t shirt and corporate polo t-shirt from Coimbatore. We are highly acknowledged organization engaged in presenting a remarkable range of Ladies Sports T-Shirt. 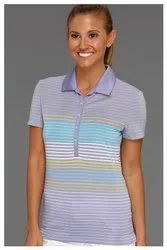 Being a leader in the industry, we are engaged in offering a qualitative range of Ladies Sports T Shirt to our customers. Drifit super serina jersey tshirt available for all age group. Excellent stiched. Superior quality. Introductory offer . Callup for more details or visit shop.